Historic South End saw America’s first gold rush and Charlotte’s first railroad. The first train moved through Charlotte (and South End) in 1852, followed by cotton mills and the rise of surrounding neighborhoods Dilworth and Wilmore. South End became Charlotte’s first industrial park. While South End declined as mills moved elsewhere, the area was reborn in the 1980s with the creation of Gaines Brown’s exhibit design shop and the related influx of creatives like artists, filmmakers and entrepreneurs. 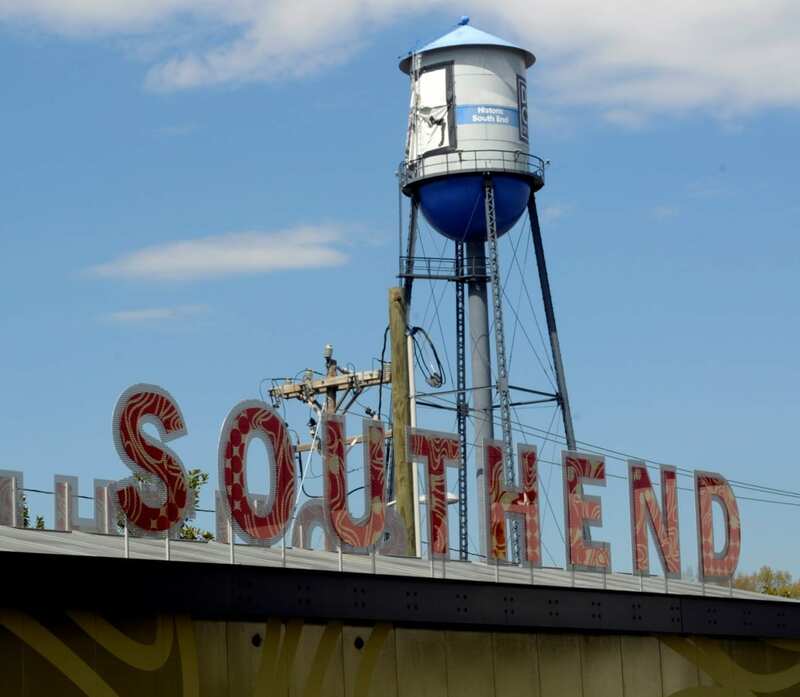 Today, South End is a bustling and vibrant neighborhood booming with the development of apartment buildings and breweries, the creation of weekend activities and the growth of a young-professional population. Pro tip: Browse the shops (hello, Free People and Anthropologie) and sights at Atherton Mill if there’s a wait. Expect a relaxed atmosphere with plenty of TVs to catch the game, and Southern flair. The menu ranges from fried chicken, to wings, to shrimp and grits, with hearty salads and black bean burgers as well. Pro tip: Chicken and waffles are found on the brunch menu. Hide away in this slick, stylish eatery (with dinner hours only) beyond the hustle and bustle of breweries while seeking Japanese cuisine. Order ramen, sushi and more. Pro tip: If there’s space, sit at the sushi bar and watch the action. This So-Cal spot has an enormous patio overlooking South Boulevard, for festive al fresco dining. Guac and chips, tacos and quesadillas, rice bowls and salads — you’ll find it all once you order that margarita. Pro tip: The street corn is a must. Welcome to the Tex-Mex home of bottomless rice and beans with your lunch order. Don’t overlook the puffy queso tacos, fajita nachos or ceviche. Or that delicious avocado salsa for chip-dipping. Pro tip: Due to the shortage of parking in the area, this gem is most easily accessed via scooter. This new sweet spot that looks like a little jewel box on Camden Road has been all the rage in the summer heat. The artisan ice-cream company serves up scoops with a variety of flavors (dairy-free included). Pro tip: Everyone talks about the Brambleberry Crisp. Stop in for locally crafted ice cream that varies from traditional flavors to creative concoctions. The ice cream bases here are made from fresh milk, cream, sugar, spices and fruit. Pro tip: There’s a Dunkaroos flavor and that’s all you need to know. AT LAST, Common Market South End has opened in a new, bigger location. Just like before, the market is packed with quirky trinkets, a deli window (mmm, two-scoop hummus salad), fridges full of drinks like kombucha and coconut water, snacks, a full bar with beers and wines, and a funky patio. Pro tip: Get a $5 wine by the glass. This tapas and craft cocktail lounge offers a handsome dining (and date-night) experience, with upscale fare like charcuterie, American wagyu tartare and ricotta gnocchi. Pro tip: Try the cold-smoked Uncle Eddy cocktail. Step inside for fresh, raw vegan fare. The few cooked options include veggie burgers and seasonal soups. Pro tip: The Living Burrito, a long-standing menu item, is a must-try. 1300 S. Blvd., Ste. S.
This neighborhood hangout in South End doubles as a fast-casual restaurant and grocery, and is the latest concept by Michael Shortino of hip ramen hole-in-the-wall Futo Buta. The menu features coffees, libations, sandwiches, salads and breakfast items, while the overall space holds pet retail, a retail wall of wine (complete with a sliding ladder), knick knacks and succulents for sale in handcrafted pots, and grocery items like honeys, sauces, and jams. Pro tip: Don’t ignore the giant cookies in the glass case by the cash register. This tiny, cozy ramen house is brimming with steaming broths and slurp-worthy noodles. Pro tip: Whet the appetite with the crispy fried Brussels sprouts. The menu in this corner spot features locally sourced ingredients in freshly made sandwiches, salads, grain bowls and more. Venture in for morning coffee, breakfast, brunch, lunch, dinner or an evening glass of wine. Pro tip: There’s a new patio — take a seat while the weather is still nice. The Packhouse functions as a sit-down restaurant serving healthier Southern fare while its sister space, Joe and Nosh, acts as a quick-serve food and coffee spot. These two establishments under Treehouse Kitchen support the nonprofit Behailu Academy. Pro tip: sink into one of the rocking chairs out front with your cocktail (from The Packhouse) or your coffee (from Joe & Nosh). Named for Ray Lai beach of Thailand, this sleek restaurant offers traditional Thai street food, sushi and different Asian dishes. Pro tip: Start with a specialty cocktail and edamame. 1400 S Church St., a. This place describes itself as a “southern BBQ restaurant with a heavy Korean inspiration.” That means chicken (and tofu) wings galore, as well as fish and pork dishes, and delicious vegetable sides. Pro tip: Order the half and half wings: Half spicy, half soy garlic. This grungy breakfast spot serves up hot coffee and bagels galore with creative topping combinations. Pro tip: Take time to read the messages on the graffiti walls while you bite into your steamed bagel. This longstanding and beloved, unassuming hotspot for fried chicken has been operating for 55 years and counting. Don’t forget about the slaw and hush puppies on the side. Pro tip: This spot is cash only, so come prepared. Cure your chips and salsa cravings while you order a margarita and tacos, or other Tex-Mex fare. Pro tip: Order $2 tacos on Tuesdays. This barbecue joint boasts award-winning Carolina barbecue (ahem, second place in the whole hog at the 2017 Memphis in May). Mac’s also has 300 cold beer options and “old-school,” comfort-food sides like mac n’ cheese. Pro tip: Sit on the patio for a chance to catch live music. This humble establishment has served Charlotte for about 50 years and is known for its burgers and soft-serve ice cream. Pro tip: You’re allowed to combine as many flavors as you want in a milkshake. Take advantage. This restaurant concept, which shares a space and ownership with Hyde Brewing, offers breakfast, lunch and dinner with its taphouse, coffee bar, fermentation lab and cafe components. Pro tip: Drink in the beautiful, plant-infused space while you drink a selection from the coffee bar (where coffee is viewed as art), or beer tap. This old-fashioned shop was featured in the movie “Shallow Hal” and serves up salads, soups, sandwiches, flat breads, burgers and, of course, bottled sodas. Pro tip: Order that root beer float you miss from childhood. Settle into a chair under strings of white lights in this charming wine shop and order by the bottle or glass. You can even choose from a craft beer selection. Pro tip: Keep an eye out for evening events, like tastings. If you’re drawn to nostalgia, you’ll fit right in here. The lounge tucked into the back of the building containing SouthBound on South Boulevard can be accessed when you lift a phone off the hook to be connected to a hostess inside. you’re one $20 membership fee away from snacking on small bites like a mezze sampler and Irish truffles, and sipping on wines, beers or signature cocktails like the Gin Fizz with Mother Earth gin and lemon foam. Pro tip: Don’t miss that cocktail placed right in front of your face when you sit down. That there is your complimentary house punch. Rebranded from Helles & Dunkel, The Union is meant to be a neighborhood spot where people can drop in after work and and feel like they are part of the community. Guests will enjoy a vast assortment of beers and spirits, not to mention wines, plus Prosecco on tap (for your weekend Mimosa). Pro tip: There’s a beer pong station just begging you to use it. This bodega is South End’s latest dog-friendly establishment (after all, it is named for the owner’s two rescue pups), with a dog-friendly patio and backyard area. Stop inside first for wines and beers (by the bottle and by the glass), pre-made charcuterie boards, snacks and more. Pro tip: For a more robust meal check out the food truck to the side (the tacos are fantastic). Recently under new ownership, this unassuming shop has local, regional and national craft beer. Thanks to new alcohol permits, cider and wine are now available as well. Other changes are coming, too, like increasing the available draft taps and installing a walk-in cooler. Pro tip: If you need caffeine, too, this is also still the home of HEX Coffee. First hitting the scene as a pop-up café that brought people together in unfamiliar places, HEX Coffee now shares a space with Good Bottle Co. and brings people together with familiar coffees, and an emphasis on espresso. There’s plenty of experimentation, too, for a hint of the unfamiliar, from shandies to matcha-based beverages. Pro tip: Keep an eye out for locally baked Whisk and Wood pastries when you grab your coffee. This place feels like a low-key college dorm lounge, in a good way. Grab a bottle of wine to uncork at the bar or the beer of your choice. Pro tip: Join nights with games and live music on the weekly schedule. As the Unknown website puts it: “Our beer is one thing we take serious, everything else in life we don’t.” Come in here and be yourself, kick back with a variety of IPAs, stouts, porters, seasonal brews and more. Pro tip: If you’re in the mood for something nonalcoholic, their signature ginger ale is spicy and light. Enjoy the expansive beer garden on a nice day, where you can typically catch a live band, a food truck and a regular yoga class. The tap room is small but bright, where you can track down brews ranging from small batch, to seasonal, to flagship to barrel-aged. Pro tip: For the non-beer drinker, sip on the surprising variety of wines and ciders. Gather in the taproom, which is huge and holds comfy couches, a bar and long tables. If you’re not busy trying the extensive list of kombuchas or brews (think gluten-free wild ales, gluten-reduced beer, sours and traditional ales and lagers), there are plenty of activities to partake in during the week: trivia, live music, yoga, upbeat fitness classes and pop-up markets. Pro tip: Taste-test a flight of kombuchas — you can’t go wrong with their clarity and effervescence. This brewery prides itself on developing a unique variety of beers including IPAs, farmhouse ales and sours. The robot in the name represents the American innovative spirit. Pro tip: If you want to add some fitness to your beer drinking, the Runbots Run Club meets on Tuesdays. Triple C’s barrel room offers big tables, expansive windows and 20 taps including beer and wine. Pro tip: A food truck is onsite just about every day. Check the schedule here. Park yourself in the 8-acre property’s gravel Biergarten, which is modeled off of the famous Biergartens of Munich. Sip on German-style beers. Pro tip: Get lost in the crowd during Tuesday night OMB Yoga on Tap classes — they bring in hundreds of yogis. Welcome to Charlotte’s first cidery, which serves up sweet, hopped and dry cider varieties. Pro tip: Take a free cidery tour on select days of the week. Check the schedule here. Go wild at this self-serve bar (you just swipe a wristband at the wine and beer taps, enjoy, and pay at the end). Pro tip: Don’t miss out on the new permanent food truck here, Twisted Eats by Kre8 Xperiences. This light-filled space provides an array of meads, ciders and special releases. Pro tip: Order a flight to maximize your taste-testing experience. Paired with drinking and dining destination The Suffolk Punch, Hyde Brewing adds to the vision of “a collective campus for craftspeople.” Hyde’s focus is beer and coffee. Expect international beer and local craft beer selections and, eventually, their own brew. Pro tip: Bring your pup to the patio. Get a kick of caffeine with locally sourced coffee featuring styles like aeropress, drip and espresso. Pro tip: Try the seasonal menu selections (we adored the summertime beet latte). Inside this café atmosphere, find a variety of coffee styles, teas and pastries. Grab wine by the bottle or one of the 36 beers on tap and browse the shelves of groceries focused on cheese and agricultural sundries. Pro tip: Catch a weekly movie at sundown with your drink. Take a breath in the light and airy space at Atherton Mill, where a variety of coffees and WiFi connectivity abound. Pro tip: Try the cold brew — it’s hard to resist. Watch the big game in this sports bar that serves up beer, wine, cocktails and American cuisine. Pro tip: Sunday brunch includes a Bloody Mary Bar. Here, you can add pool to your night life. Pro tip: Expect weekend drink specials like $3 Coronas and $2 mimosas. This neighborhood bar adds DJs, karaoke and live music to the drinking scene. Pro tip: Come for the cover bands. This craft beer shop specializes in craft beer and wine from North and South Carolina. Pro-tip: The owners are dog lovers (just look at the logo) and the patio is pet-friendly. Atherton was once a multi-building factory created by the Parks-Cramer Company in 1919. Catch Saturday farmers market hours (listed on the website) to shop a variety of local vendors. Tucked into the building, Savory Spice Shop is a local favorite for spices, seasonings, herbs, sauces and bitters. Bigger-name shops in the building include Alton Lane, Free People, Brideside, Anthropologie and Warby Parker. Pro tip: If you stop at Savory Spice, do stop and smell the spices — there are testers available. Shop road shoes, functional shoes, trail shoes, clothes, safety gear and more at this runner’s paradise. Pro tip: Ultra supports weekly running events in the area. Check out the details here to get involved (and get running). Pet Wants, which emphasizes all-natural, fresh ingredients, offers cat and dog food as well as a smorgasbord of pet treats from lamb ears to tuna melt cookies. This little shop offers invitations and stationery by a variety of brands. Pro tip: ROOTS café is right down the sidewalk if you need a space to write. Check out modern furniture, lighting, custom rugs and local art. Pro tip: In-store and in-home design appointments are available. 128 E. Park Ave, Ste B. Take a look at the blend of art and functional crafts by local, regional and national artists. Pro tip: The gallery switches up its exhibitions regularly, so there is plenty of fresh work to see. This 2007 public art installation by Tom Thoune spans the 360-foot Camden Wall along the LYNX Blue Line. Pro tip: Get a close-up of the 33 mosaic inserts — they feature various materials from stone, to glass, to objects donated by the community and they have a story to tell. With several light rail stations dotting the track through South End, it’s easy to catch a ride into Uptown, University City or away to south Charlotte. Pick your adventure. Pro tip: Check the schedule before you venture to a station to save time. You don’t even have to board the light rail to enjoy all the spectacles that the Charlotte Rail Trail has to offer. Check out the Rail Trail Symphony near New Bern Station, Edna’s Porch by Carson Station, the Magic Carpet Mural across the tracks from Atherton Market, and more along this 4.5-mile public trail. Pro tip: Walk this route to your next drinking or eating destination to spice up your travel time. The door in the parking lot should be unlocked during “regular” business hours to give the public access to tenants including photographers, painters, art consultants and other creative types. All of the walls along the three floors of studios are lined with art to look into, get lost into. BYOB and join an intimate cooking class with Chef Alyssa Wilen. Classes range in skill level and topics have included game day favorites, harvest Italian and vegetarian tapas. The best part: After cooking, you get to sit down to your meal. Love to sing? There are four themed, private karaoke rooms you can rent at Seoul Food Meat Co. Pro tip: Reserve the rooms in person or call 980-299-5143. This post originally ran on CharlotteFive.com.